CH FLAKKEE FOTO FINISH UD,TT, HOF. 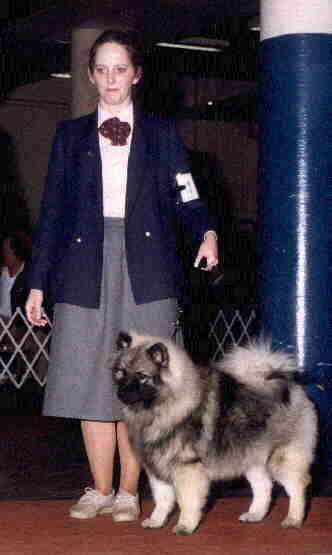 MY FIRST SHOW KEESHOND-AND MY BEST FRIEND. HE IS SHOWN HERE WINNING HIS FIRST MAJOR! FINNY TAUGHT ME WHAT IT TOOK TO BE A WINNER! I HAD NO CHOICE AS HE WAS GOING TO WIN WITH OR WITHOUT ME! ALWAYS A WONDERFUL PUPPY WHO WAS RATHER TOO SMART AND THIS OFTEN GOT HIM INTO TROUBLE! HE WON BEST IN MATCH AT THE LAWRENCEVILLE A MATCH AND ALSO AT OUR NORTH GA KEES CLUB SPECIALTY MATCH. I WILL SHOW OTHER PICTURES OF HIM AS HE WINS RWD AT OUR FIRST NATIONAL SPECIALTY-TAKES HIS FIRST LEG OF HIS CD-AND WHEN HE EARNS HIS UD. MY FINNY DIED AT THE AGE OF 16 AND THROUGH OUT HIS LIFE HE WAS ALWAYS THERE FOR ME-DOING WHATEVER I ASKED-WITH A SMILE. OB INSTRUCTERS--VICKY JONES FOR NOVICE AND FOR THE HIGHER CLASSES WE WERE HONERED TO HAVE TERESA TURNER WHO WAS THE OWNER/TRAINER OF THE FIRST EVER OTCH KEESHOND.